You will always be able to frolic through the forest with this super cute (and scrap-friendly) quilt. 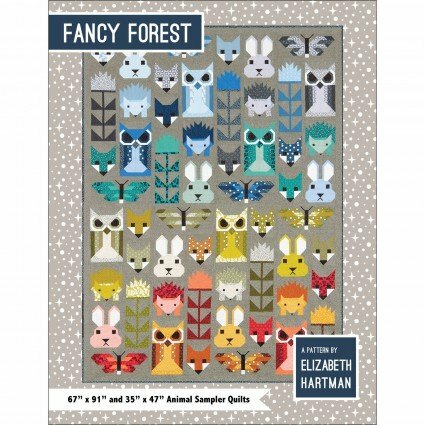 Fancy Forest is a delightful sampler quilt featuring some of Elizabeth Hartman's most popular block designs, including Fancy Fox, Hazel Hedgehog, Bunny, Allie Owl, Thistle, and newcomer Frances Firefly. The 67" x 91" Large Quilt is perfect for a Twin bed or to use as a sofa/large lap quilt. The 35" x 47" Small Quilt makes a perfect baby quilt or wall hanging. All blocks are sewn with simple straight and diagonal seams. No templates or paper piecing!